Texas Labor Code, Chapter 21. Individuals who feel they have been discriminated against or subjected to harassment should contact the Office for Inclusion and Equity (OIE). All inquiries will be kept confidential, to the extent permitted by law and University policy, and no person should fear retaliation. OIE serves the University in fulfilling the intent and spirit of equal opportunity laws by providing equitable resolutions to complaints and striving for an environment free of discrimination, harassment, retaliation, sexual misconduct, and inappropriate consensual relationships. You have the right to raise discrimination and harassment concerns. You also have the right to utilize available resources, such as OIE, and do not have to follow any “chain of command” before contacting OIE. University policies prohibit retaliation against individuals who participate in OIE’s complaint process. If you believe you have experienced prohibited retaliation, you may contact OIE to address this concern. In addition, at any time during the process, you have the right to consult individuals or agencies external to the University, including the U.S. Equal Employment Opportunity Commission and the Texas Workforce Commission. Individual contacts OIE to discuss issue or behavior that is causing academic or workplace concerns. Following a consultation meeting(s), the individual decides to seek resolution of the complaint through the informal process. The informal process provides an individual with the opportunity to give notice of a perceived wrong and have OIE informally address the concern. The informal process provides an individual with the opportunity to raise awareness about the concern that is believed to be discriminatory/harassing/retaliatory in nature. The informal process provides OIE with the opportunity to have an educational discussion with the individual(s) allegedly responsible for the perceived wrong. The informal process does not involve a formal investigation. There is no formal finding of a policy violation as part of the informal process. OIE may, however, notify applicable supervisors of the concern, recommend official documentation of the concern, recommend additional training, and/or use other mechanisms to appropriately address the concern as appropriate. The informal process is generally completed in a relatively short amount of time. Individual contacts OIE to discuss issue or behavior that is causing academic or workplace concerns. Following a consultation meeting(s), the individual decides to seek resolution of the complaint through the formal process. Complainant submits a formal complaint. OIE conducts a formal investigation of the allegations as a neutral party, including meeting with the named respondent(s) and any applicable witnesses. OIE prepares a written report with findings of fact and recommendations concerning potential policy violations. OIE consults with the vice president of the portfolio to achieve an equitable resolution to the situation. Based on the investigation findings, there may be discipline and/or other remedial measures deemed appropriate to resolve the complaint. The duration of the formal process is typically substantially longer than the informal resolution process. University department contacts OIE regarding a situation or behavior that is causing academic or workplace concerns. Following a consultation meeting(s), the department requests OIE to investigate the situation or behavior through the departmental process. 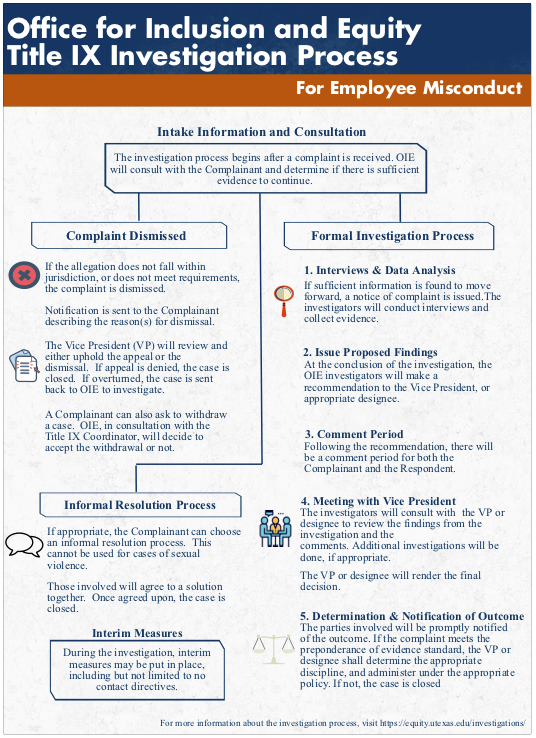 Generally, OIE works directly with a department to investigate and resolve departmental complaints. 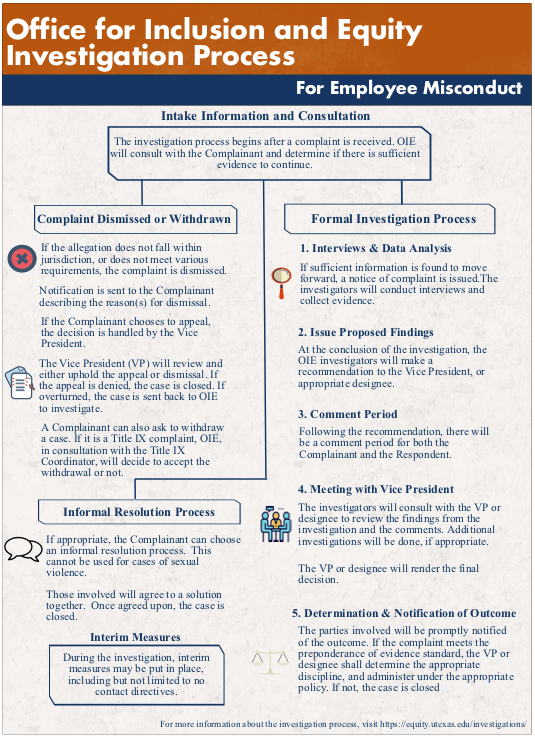 The departmental process typically involves OIE conducting a formal investigation as a neutral party, including meeting with potential complainants, respondents, and witnesses. OIE prepares a written report with findings of fact and recommendations concerning potential policy violations. OIE consults with the vice president of the portfolio and/or the department head to achieve an equitable resolution to the situation.